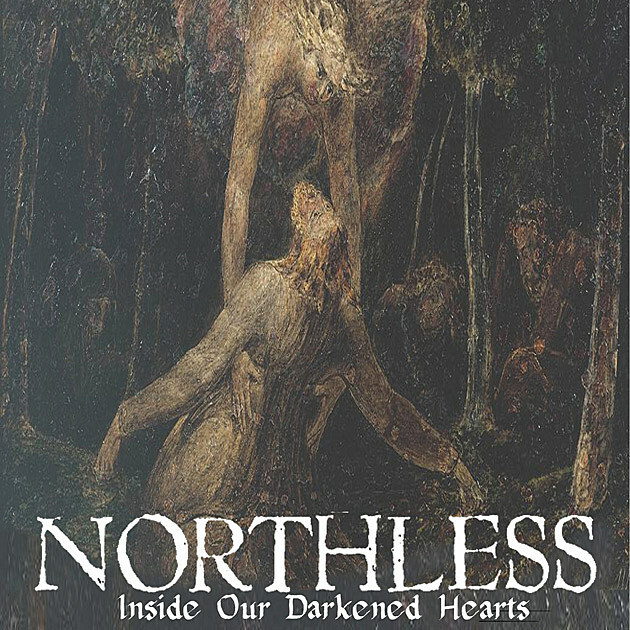 Milwaukee’s sludge/doom 4-piece Northless < > are offering a chance to preorder their upcoming compilation, titled Inside Our Darkened Hearts. Coming in June, the 16 tracks on Inside Our Darkened Hearts compiles the Northless back catalog, including their out of print 2008 self titled release that contains the tracks “Await the Fires of Man”, “Wasteoid”, “Revenant”, “North Star”, and “Sink or Swim”. The compilation skips over 2009’s No Quarter for the Damaged, but does include the track from 2009 split with Protestant and a track from an Inherent Records compilation. Nearly one and a half hours of ear crushing assault that channels Eyehategod and Drudkh . . . blackened Unsane is a good comparison. It’s heavy and rough, but not so much that their music doesn’t allow the songwriting craft to come through, or prevent moments of fragility. Inside our Darkened Hearts includes a download code, an exclusive limited edition 10 x 13-inch screenprinted back patch with art by Nate Burns, 5.50 x 2.14-inch Northless crest sticker, and “Inside Our Darkened Hearts” 1-inch button, plus extra Skeletal Lightning goodies. Limited to 100 copies as a limited edition red-tinted 2xTape bundle. Odrer yours at Error Records.